Valet parking WILL be available on the 24th! Look for it under Pages in the column to the right (or click HERE). … for providing refreshments and sponsoring the FWRW Board of Directors meeting in October! 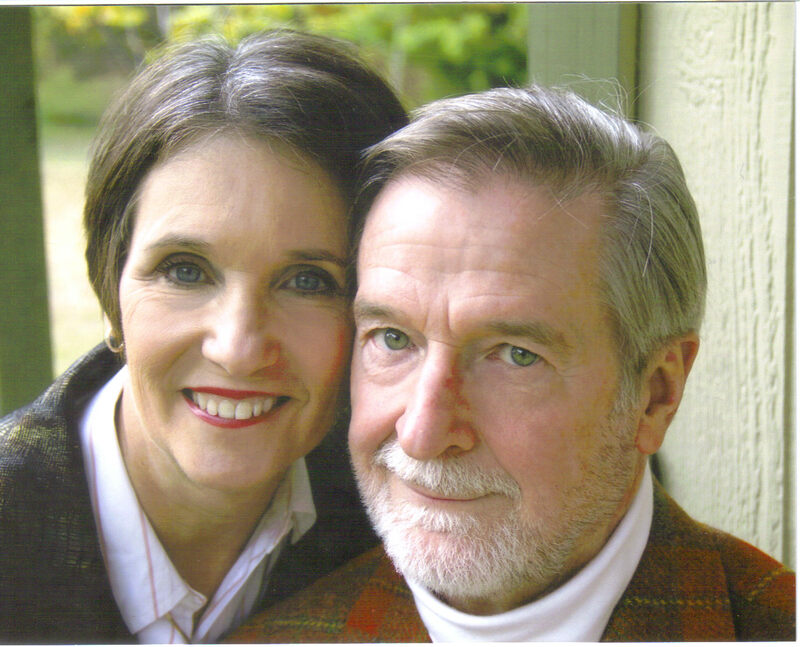 Stacia has been a member of Fort Worth Republican Women since 2009, during which time she has served our club as a willing volunteer and avid supporter. Once again, thanks for your support, Stacia! 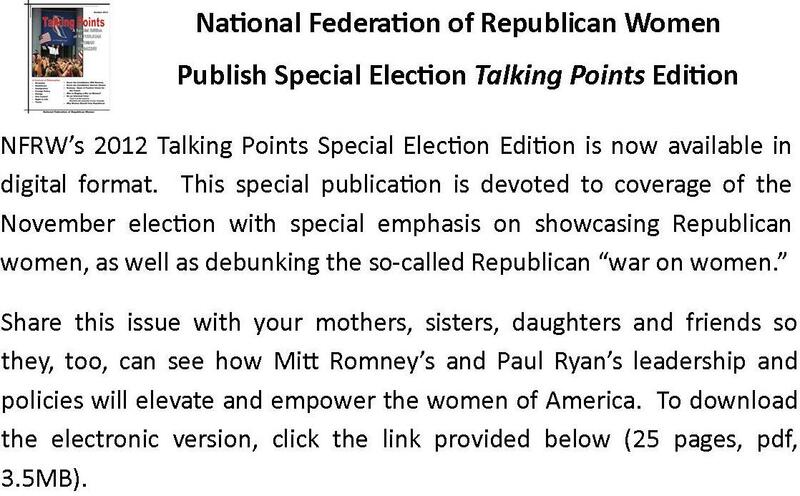 Link to NFRW’s 2012 Talking Points Special Edition – http://www.nfrw.org/documents/magazine/Election2012.pdf, or click HERE. 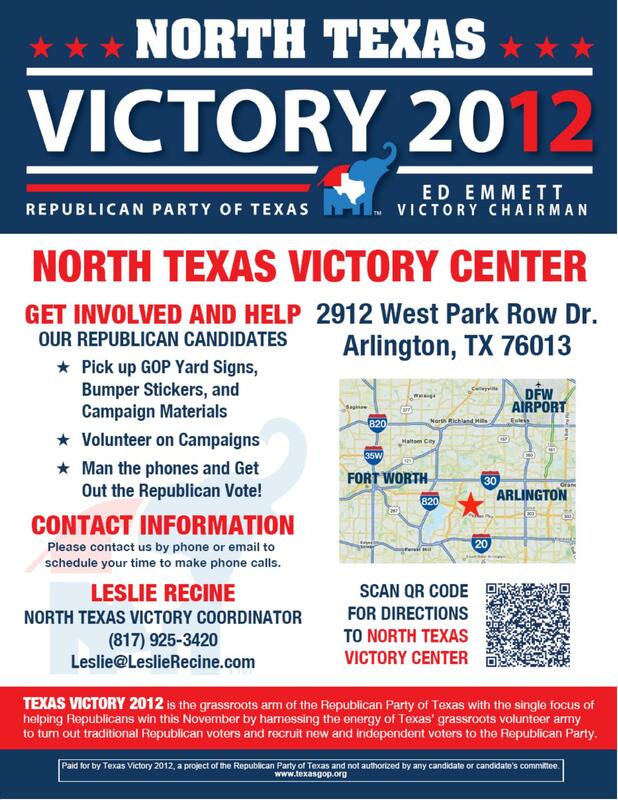 Volunteers are needed at the North Texas Victory Center phone bank to help elect our Republican ticket. The North Texas Victory Center, located at 2912 West Park Row Dr. in Arlington, 76013, is open Monday-Saturday 9am- 8pm and Sunday 1-4pm thru Nov. 6th. Make some calls and pick up a Romney/Ryan yard sign or bumper sticker. You can have fun meeting new Republican friends, too! Who is the real Mitt Romney? If you want to know more about the personal side of Mitt Romney, watch this video which aired on CBS This Morning. Learn about “Doing Business the Morman Way,” about a man who won’t brag about his generous and giving nature, who has lived his life walking the walk, rather than simply talking the talk. Then share this with your friends. Every voter needs to see this. Use the link below or click HERE. 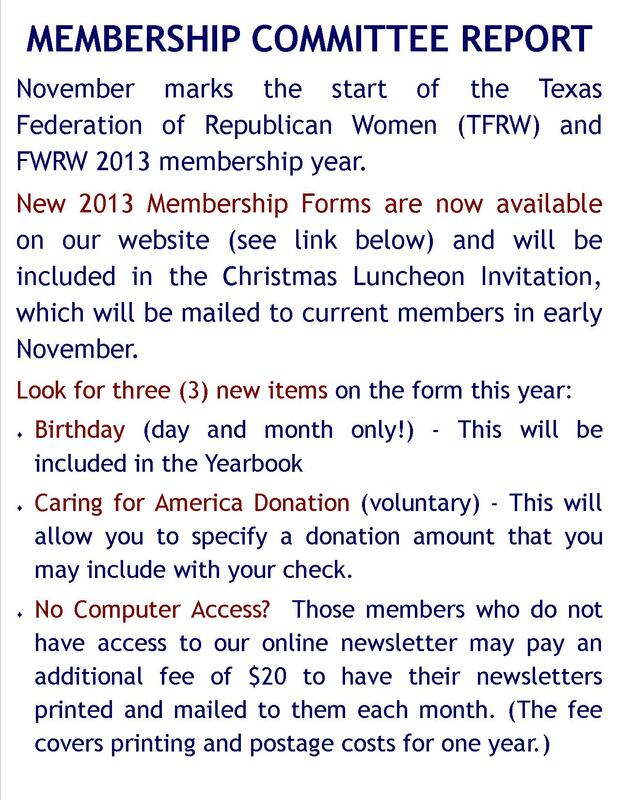 Link to the Membership Form on FWRW’s website – go to http://www.fwrw.org/images/2013_FWRW_Memb-Form.pdf or click HERE. The Second Presidential Debate is TONIGHT – Tuesday, October 16 at 8:00pm Central Time. 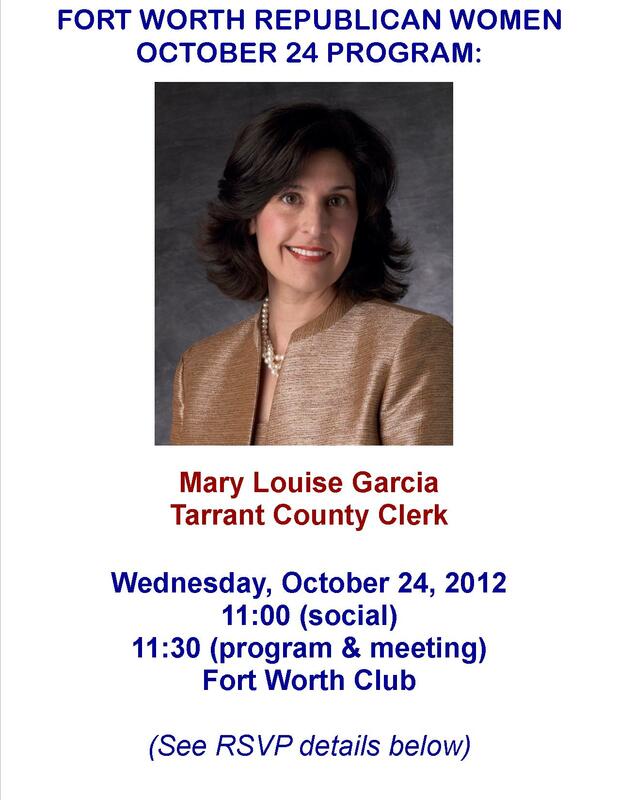 Topic: Town meeting format including foreign and domestic policy. Location: Hofstra University in Hempstead, New York. Sponsor: Commission on Presidential Debates. Moderator:Candy Crowley (CNN Chief Political Correspondent). The Third, and Last, Presidential Debate will be on Monday, October 22 at 8:00pm Central Time. Topic: Foreign policy. Location: Lynn University in Boca Raton, Florida. Sponsor: Commission on Presidential Debates. Moderator: Bob Schieffer (Host of Face the Nationon CBS). The Romney-Obama debate was bizarre for so many reasons. Usually spin masters needle the media immediately to “prove” that their so-so candidate won. But after this debate, almost no one made the argument that Obama was close to winning — so great was the risk for even a toadying media to look ridiculous and so clear-cut the ineptness of the president. While losing debaters often can postfacto snipe about the slickness of their successful opponent, I can’t remember a disappointed loser replaying and reconfiguring the debate over the next few days on the campaign trail, in the weird fashion Obama has been offering teleprompted counter-arguments that he could never muster on his own during the actual faceoff. The classic blowhard, after all, is the loud blusterer, who always retells his own arguments and run-ins from the perspective of his own genius, thereby offering the embarrassing proof that he regrets just how poorly he was outfoxed and outargued without a script. The common denominator here is the old story of the vast gulf between the reality and mythology of Barack Obama. Although Obama had sometimes shown some of the smarmy cool and set-speech fluidity of a John Edwards, otherwise there was never much evidence that Obama had ever excelled in debate or repartee — perhaps explaining why he wisely had consented to the fewest press conference and one-on-one Q-and-A press sessions of any recent president. His reliance on the teleprompter has no recent presidential parallel, but was always wise even for the briefest of appearances. And yet even here, the chameleon-like set-speeches quickly become monotonous and the faux cadences jarring rather than clever. Yet perhaps the reason for Obama’s reluctance to face questions and counter-argument was not just that Obama is not very good at it and resents doing his homework (“a drag”), and not just that his economic and foreign policy records are dismal and would be hard to defend under scrutiny, but largely that he has had scant need to work on debating or sharpening his analytical skills — given the investment of the media and popular culture in his success. An often distracted and diffident Obama has astutely understood that his own fortunes were in some strange way a referendum on the liberal sensibilities of legions of neurotic but influential elites. That realization had excused him from much of the mundane worries of other politicians — almost as if problematic things like polls, government statistics, laws surrounding lay-off notices, or controversies (from Fast and Furious to the Libya consulate disaster) would all be properly adjusted by others more interested in his success than he in his own. How else could he be so recklessly careless in his effusive praise of the odious racist Rev. Wright, or so patently insincere in his demagogic and racialist rants before largely African-American audiences? How else could he simultaneously demonize the Bush anti-terrorism protocols while embracing or expanding nearly all of them, or so clearly provide his own arguments (e.g., deficit will be cut in half, if he hasn’t solved the problem, he would be a one-term president, etc.?) against himself? Does all this mean that Obama cannot bounce back a bit in the next two debates? Not really. Expectations have changed after the greatest audience in the history of presidential debates saw a veritable empty suit — or empty chair — on stage, without a helpful media follow-up question, or a “make no mistake about it” refrain to be had. Over 60 million now expect little at all from their president in the debate, so Obama will benefit from dismal expectations by just showing up as the incumbent and being addressed as “Mr. President.” The pressure on Romney to be even more impressive mounts. The realization that another rant by a liberal commentator could cement the reputation of Obama as an incompetent and add to the image of a hopelessly inept president will temper post-debate media anger. The moderator cannot afford to be laissez-faire in the fashion of Jim Lehrer, and will prove far more partisan. The media pressure to discount the importance of the debates themselves will increase. But despite all that, the nation has now seen that the conservative critique of Barack Obama — fluff without substance — was frighteningly accurate. Editor’s Note: This article, “Anatomy of Disastrous Debate Performance” by Victor Davis Hanson, has been reprinted in full from PJ Media. We encourage you to visit the original. Lunch is $23 with a reservation ($25 without reservation). 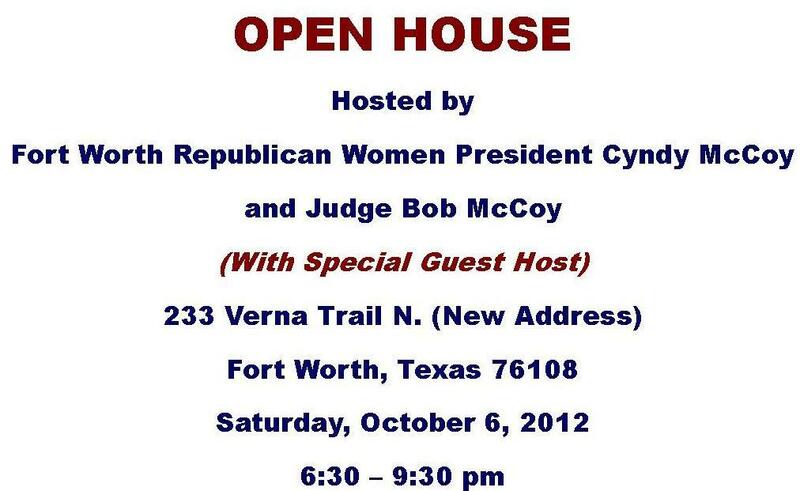 Open House at the McCoys – Tomorrow Night!